As one of Disney's "Signature Restaurants," The Hollywood Brown Derby had incredibly high expectations in my book. How did it turn out? While a margarita flight and dessert I've been craving for years received high marks, some other elements left a lot to be desired. Located near the front of Disney's Hollywood Studios, The Hollywood Brown Derby has been a part of the park since its inception. As a replica of the authentic Hollywood Brown Derby in California, the restaurant feels right at home at the Studios park. As you approach, the entryway is covered and leads to a set of understated double doors. On the inside, the lighting is dim and the fixtures are a mixture of California colonial and mission style. The "welcome mat" for The Hollywood Brown Derby. Minimal, classic details in The Hollywood Brown Derby lobby. Look around, and you'll notice caricatures of various celebrities of yesterday flanking the walls. There is a distinct level of sophistication that Disney puts into their Signature Restaurants. As a Signature, Hollywood Brown Derby features sophisticated decor, better ingredients and higher prices. If you're dining on the Disney Dining Plan, you'll use two Table Service credits here. Using the Dining Plan at Signatures is almost always a bad idea, however, I do attempt to dine at a Signature at least once per visit. Also of note, Tables in Wonderland is accepted here, and nets you 20% off of food and alcohol. Thanks to AJ at the Disney Food Blog, I knew ahead of time that The Hollywood Brown Derby featured a drink menu that deviates from the now ubiquitous and boring Disney Parks "standard" bar menu. Somehow, I inherited the pro-tequila gene in my family, as I'm the only one who can handle it without getting mean! In order to take full advantage of my good genes, I ordered the Citizens Take Flight margarita flight. Priced around $12, this flight included three rather large samples of margaritas from Derby's bar. There was a silver, mango and pomegranate margarita. The pomegranate was my favorite; I tend to like sweet drinks. The mango was nice, also on the sweet side, albeit a little tart. The silver was a standard margarita. After a while, the ice started to dilute the flavor and the salt started to fall in. If margaritas aren't your thing, they also had a martini flight and several other drink selections. If you're reading this and have never dined at one of the sit-down restaurants at Walt Disney World, the menu is formulated as follows: steak (filet at Signatures, strip everywhere else), chicken, pork, fish, sometimes pasta and vegetarian. Let's face it; the menus are designed to please the masses, and for the most part they do. In most cases, I usually find several dishes that appeal to me and narrow down by the side dishes. To start at The Hollywood Brown Derby, I'd be remiss if I didn't try the Famous Cobb Salad. There's such a great story behind the creation of this dish, and it's offered here in an appetizer and entree size. I've heard tale that they offer to mix the salad for you table-side, but I received no such offer. More on that later. For a starter salad, it was quite god. The greens were minced to an almost imperceptible consistency and the dressing and avocado were creamy and on-point. Bleu cheese is one of my food turn-offs, so I kindly requested that they leave it off. It was a gigantic portion for an appetizer. Traditionally, I don't eat a lot of red meat. However, I'm a sucker for a good filet. The filet I had at The Hollywood Brown Derby was one of the best I've had. I ordered it medium well and it was served over mashed potatoes and green beans. Over top was a delicious truffle mushroom butter that melted and dripped down over the potatoes, resulting in a delicious, salty, slightly sweet mixture. The dish was decorated with a fried waffle potato which was nice for crunch. Like I said, one of the best ever. I cleaned my plate. On this trip, I dined with my mom and sister. I've only ordered pork once in a restaurant, at Be Our Guest back in January. I'm not normally a fan of the consistency or taste of a pork chop. My mom and sister however, ordered the Sterling Silver Pork Chop. It was topped with smoked gouda and apple slaw, and served over a potato hash with napa cabbage, bacon and cider jus. Everything about this meal was going well. We were winding down after a long day of traveling, enjoying an afternoon at Disney's Hollywood Studios and enjoying each others' company. Then my sister cut in to her pork chop and it was raw. Call me old-fashioned, but I fall into the school of though that there are a handful of meats that should never be served undercooked. Poultry and pork come to mind as two of the most crucial meats to cook thoroughly. Apparently, pork can be served undercooked. Modern food processing regulations eliminate the need to cook pork beyond 145 degrees, according to the USDA. If you're not used to cutting into pork and seeing pink, ask for it to be cooked a little longer. Service at The Hollywood Brown Derby was fantastic up until this point. After our waiter brought the food, we sat for about 10 minutes attempting to get his attention again. We finally waved down another waiter, who explained that they do not cook their pork well done and offered to take the dish back to the kitchen. Not wanting to be stricken with food poisoning on our first night, my mom and sister obliged. When the pork returned to the table, it was burnt, chewy and charred, a result of being stuck under the broiler. My sister's dish was still slightly raw in the center of the chop. The one miss of the night was with the service. We typically dine late when we're at the parks, and it seemed like our waiter was more interested in folding napkins than attending to his tables. In addition, if a restaurant plans to serve meat undercooked, and it was clear from their explanation that The Hollywood Brown Derby always serves their pork chop that way, they should inform the guest when they place their order. It was quite a shock to cut into a raw pork chop. No one likes sending a dish back, for a multitude of reasons. 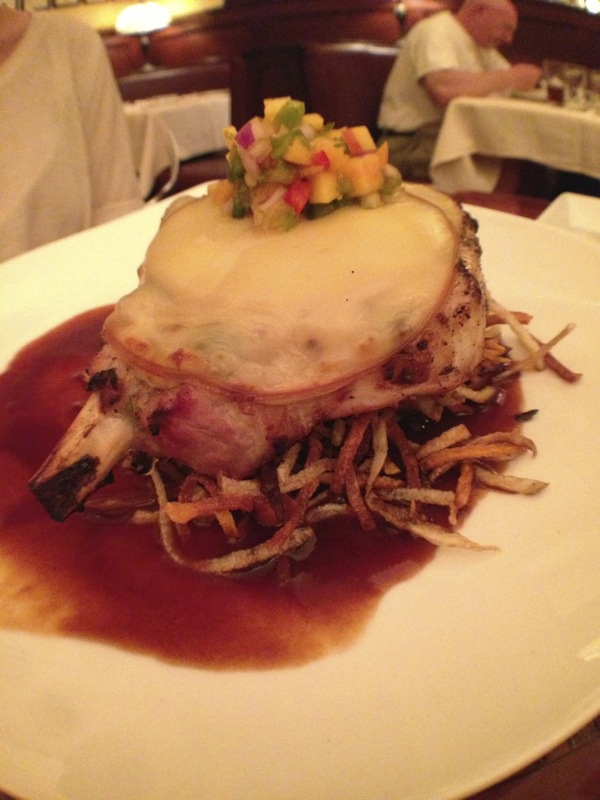 We chalked up the raw pork chop to learning something new and we were ready to move on to dessert. The Hollywood Brown Derby's legendary Grapefruit Cake was on the top our of lists! In fact, we've attempted to snag a piece from Starring Rolls Bakery to no avail for several years! Last time I was on a quest for a famous dessert at a Signature Restaurant, our waitress actually persuaded me to try something else, which is an incredible feat. At The Hollywood Brown Derby, the waiter highly recommend we try the Grapefruit Cake. So, we ordered three slices. The grapefruit flavor wasn't overpowering and not as bitter as you might think. The yellow cake was a bit stale, as if it had been in the refrigerator for a couple of days. However, the rich, creamy icing helped to smooth things out. There was a bit of grapefruit drizzle on the bottom of the plate, a slice of dried grapefruit sticking out of the side and two pieces of grapefruit as well. Overall, it's worth trying, however next time I would branch out to something different. Signature Dining at Walt Disney World is a blast. The entrees are high quality, and the setting is second-to-none. Going forward, I'm going to strongly consider our timing when we book reservations. It was a shame that the service took a dive because we were one of the last parties of the night. And now, if I do venture to order pork in a restaurant, I'll be sure to ask how it's cooked. As Disney's Hollywood Studio's only Signature Restaurant, The Hollywood Brown Derby is worth a visit. Their menu changes seasonally, so I'm sure a dish in the future will lure me in. But I wouldn't mind at all returning for a margarita flight and filet with that delectable mushroom butter! The Hollywood Brown Derby. Disney's Hollywood Studios. Reservations highly recommended. (407) 939-5277.